Other Notes: Three-dimensional, projection-style AED wall sign to identify the location of your AED. This item has been discontinued. Please use our RespondER® Flexible AED Wall Sign as a replacement. 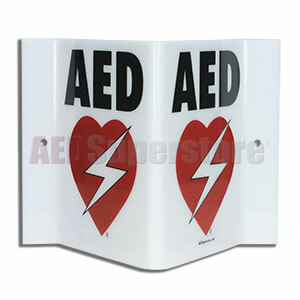 AED Wall Sign "V" Shape. This projection-style sign is great everywhere. Show customers and employees you have an AED on site. Use it to mark the on-premises location of your AED. 6" x 8.75" x 3.75" (6" x 5" Face). Vinyl. Very well built, great visibility and easy to install! Thank you.